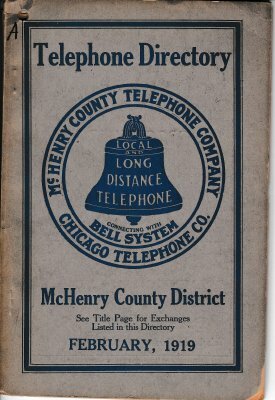 Welcome to the McHenry Telephone Directories collection! The directories cover intermittently from 1908 to 1959. Besides McHenry, the communities of Johnsburg, Woodstock and Crystal Lake are also covered in many issues. The "Click Here" link located at the bottom left of the cover will take you to the directory's "home page. All directory pages are printable or savable as PDFs.